In order to participate in the launch program, an ICANN Accredited Registrar needs to complete a further technical accreditation. 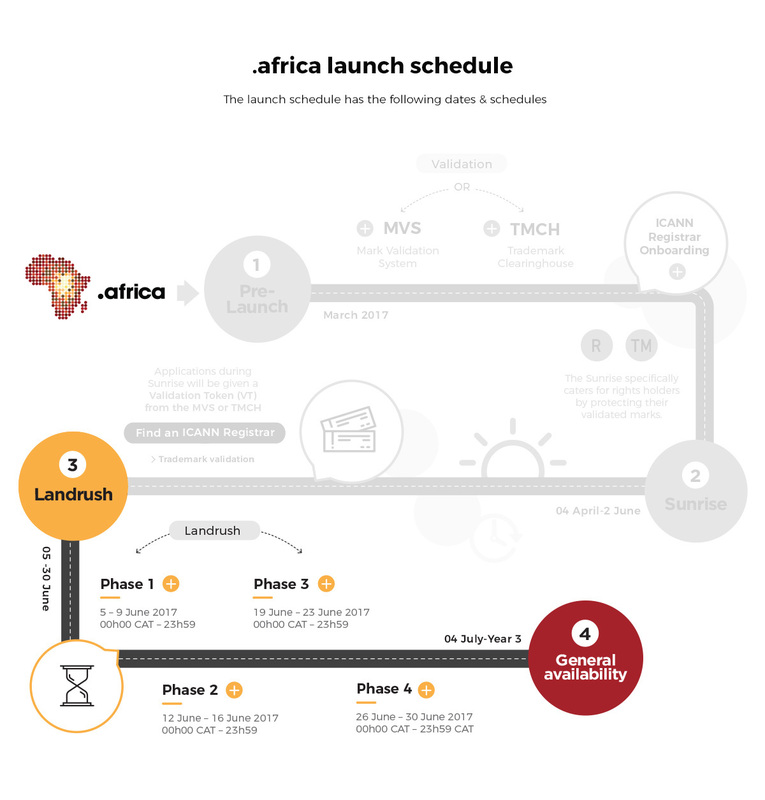 There are two phases to the launch of the .africa – Sunrise and Landrush, there are further sub-phases under each of these phases. Launches are governed by various policies that are separate from the Published Policies and Procedures that govern the continuous operations of a namespace. Registrant’s / Domain owners: You may wish to participate in Sunrise if you have any rights to a domain name. If you have a business or any rights to a name such as a trademark, apply to have your mark validated through the MVS or TMCH in order to obtain a higher priority for your domain name. You can do this yourself or through your IP Attorney. A Validation Token will then be issued for Sunrise applications which you provide to your domain Registrar or ISP for a .africa domain name application. Certain rules will apply for domain applications during Sunrise and Landrush. For example, contested domain applications will go to auction and applications with trademark rights in Africa will have priority over trademarks not registered in Africa. Click here for more info on Rights Protection and speak to your Registrar about .africa domain registrations.